Comfy home plus studio opposite beach. Great for families or small groups . Always happy to answer questions if you would like to inquire first before making a booking use the "contact owner " and I will get back to asap . I try to keep my calendar up to date . Bep`s is one of the few remaining original 1960`s houses along the waterfront at Sandon Point/Bulli. Built by Bep ,an artist ,potter and carpenter, it has now been fully renovated while retaining its unique character and many of his original features . Bep`s is most suited to couples, families and friends getaways .It is not suitable for large parties however small gatherings will be considered on a case by case basis. Bep`s Beach House has stunning uninterrupted beach and ocean views over Bulli Beach and Sandon Point.Many a whale and dolphin has been spotted out to sea while relaxing on the lounge having a morning coffee.Our guests tell us they spend hours on the lounge mesmerized by the ever changing view across the water. Located in a most picturesque area of the Illawarra .Bep`s is within metres away from easily accessed patrolled beaches and an ocean pool. Sandon Point to the north has renowned surf breaks while the beach on your door step is gently lapping and family friendly.The southern end of the beach has an ocean pool , great kids playground and licenced cafe. For your peace of mind we have been operating Bep`s for 12 years as you can see by opening our reviews.You will be provided with our phone number and location of the house sent directly through Stayz on making an inquiry or reservation. Beps`s Beach House is situated on a large level block of land. We accommodate our guests in the main house and a studio flat . We only book these areas together so you will never have to share the property with other guests. All our advertised beds are proper sprung mattresses on bases for your comfort . We have no sofa beds or bunk beds. Linen and towels are provided for guests . *Decor is comfortable and relaxed with an eclectic mix of original artwork, Bep`s pots and a touch of the beach. *Bedroom with 1 king bed. *Comfortable lounge area with stunning views. *New well appointed kitchen. We update our appliances regularly. * Large bedroom with 1 queen bed. *Overhead fan and space heaters. We also provide a laundry with new front loading washing machine.We have plenty of drying space with external and internal drying lines. We have just done some extensive garden work which includes a paved area for alfresco eating. Beefeater BBQ with bottled gas provided. Carport at side of house which can be used as a covered BBQ area with great views to the beach. We add a standard cleaning fee which covers the costs of a cleaner . If the house is left where a standard cleaning fee does not cover the costs the extra will be deducted from the damage deposit . We are also happy to consider you bringing your pet along to stay. Please make an inquiry about this before booking. *Sydney CBD 1 hour and 10 minutes by car or train. 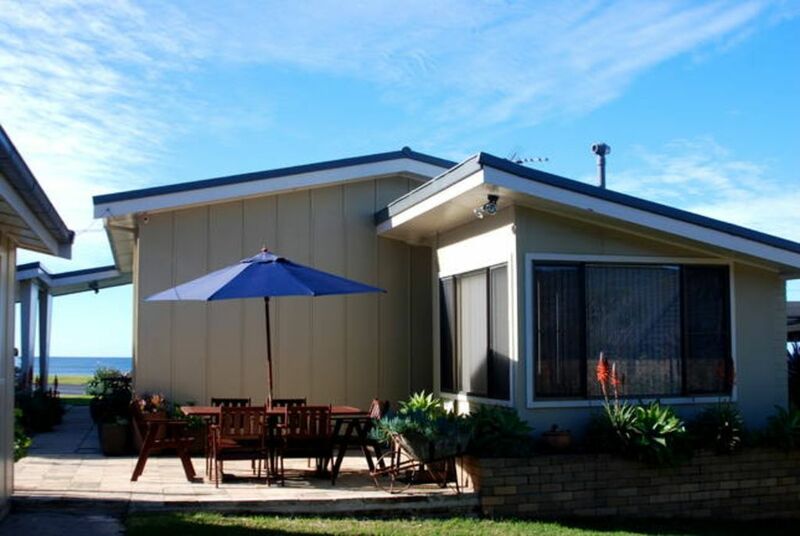 *Great for O/S visitors wanting to stay by the beach and see the sights of Sydney and the Illawarra. *Easy day trips to South Coast towns of Shellharbour , Kiama , Gerringong , Jamberoo ,Berry and Jervis Bay to name a few. *Spectacular coastal drive through Royal National Park to Wollongong and beyond. *Coastal cycleway and walking track. *Symbio Animal Park and Hang Gliding at Stanwell Tops. *Stanwell Park and Austinmer Village. *Thirroul Village for boutique shops and eateries within walking distance. *Wollongong CBD 15 minute drive. *Close accommodation to Panorama House if you are going there for function Bep's is a great place to stay. Hi , I love having guests stay at Beps Beach House. I have many years experience in the hospitality industry but now retired I enjoy the low key, friendly aspect of having guests share my beach home . The house is named after the original owner and builder . Bep and his wife Jacoba migrated here from Holland in the fifties. In those days there were a string of 50's and 60' s beach cottages along the street overlooking Bulli Beach . We are now the only original "beach shack " left. Beps is an original 1960's home which still retains much of its character but updated for today. For instance, the kitchen has had new cupboards and appliances but still retains some of the unique cabinetry of the original. All framed with an amazing bespoke archway built by Bep. The views and proximity to the water are fabulous. You can literally sit on the lounge and see the beach. Especially interesting in the whaling migration periods. The bits I like the best - grabbing a towel and wandering over to the beach for a swim several times a day. One share bathroom in main house . Toilet is seperate to shower. Studio has an ensuite. Yes you have a refrigerator . We have an espresso pod compatible machine. We do not provide pods. Also have Bodum s.
Dining area with 7 seats. we also have an outdoor eating area. This was our second stay at Bep's Beach House, a great place to unwind and relax while enjoying the ocean views. The house is very clean and simple while paying homage to a bygone era...we'll be back! Very comfortable and a beautiful view. Nice and roomy with a well stocked kitchen. We will come back! Loved the property. Very original. Well appointed. Plenty of beds. And so close to the beach! Didn't have the best of weather during our stay but just being able to look out of the huge windows at the surf was brilliant. And tremendous communication from the owners. Thank you. I booked a week away with my fur babies Harley and Stevie we loved it and were lucky enough that Peter and Jane let us stay another week, the house is great with amazing views the beds are very comfortable, great size kitchen with everything you need spacious back yard for my dogs to lay around in the sun, the house is very clean and tidy, the lounge is so comfy you can sit back and relax watching the surfers and people walking by, a very quiet street at night so all you hear is the waves it is so peaceful, the Cafe is walking distance and has great food. The only thing the house needs is a dryer for those wet days but I survived would definitely stay again and recommend it to anyone. Thank you Peter and Jane. Thank you, Always happy when our guests enjoy their stay. Welcome back anytime. We spent the weekend at Bep's and found it was in a great location, Cafe within walking distance and Woolworths only 5 min drive away. Wonderful uninterrupted views to the ocean. Property very clean and tidy and also had basic necessities supplied which was appreciated. Would stay at Bep's again.